Is your attendance management system efficient enough to keep track of your employees’ regularity? Just keeping a register on the entry or installing a biometric system is not the solution. Have you ever heard of a biometric system that intimates you about the regular absentees in your organization? Well, no biometric offers such functionality so far. So, how you deal with absenteeism? What are the patterns of absenteeism in your firm? If you haven’t paid much attention towards the pattern of absentees yet, it’s high-time to shift your focus as it could lead to stressful working hours in the time to come. Moreover, you won’t be able to focus on core business activities. Whether you have just joined an organization as an HR or have spent years working with the traditional management system, irregularity in the employee attendance is an issue that needs to be addressed on an immediate basis. Let’s just have a brief discussion on the term absenteeism first. It cannot be denied that the overall cost of absenteeism is much more than the direct income and benefits reserved for the absentees (in the case of sick leaves). There are certain indirect costs like opportunity cost, staffing, scheduling and training, diminished productivity, demotivated environment etc. that makes managing attendance even more important. » Serious illness or an accident. » Excessive work pressure, leading to stress. » Some personal problems, like marriage or childcare etc. » Not happy with the current job role. If workforce is not reporting as scheduled, this directly impacts the overall productivity of the organization. The projects will not be delivered on time and the worst case is losing a project due to lack of resources. Poor levels of productivity often result in straitened financial circumstances. Delayed projects may lead to late payments. If you are a small or mid-size company, you could fall short of funds to give salaries even to the employees who are regular at work. This further demotivates even the highly dedicated workforce while making the environment negative. Low productivity and poor financial conditions will automatically degrade the other administrative tasks in the organization. So, how would you recover your organization from a destructive disease like absenteeism? Well, technology has a solution for everyone! And for HR professionals – automated attendance management system is the best gift ever. 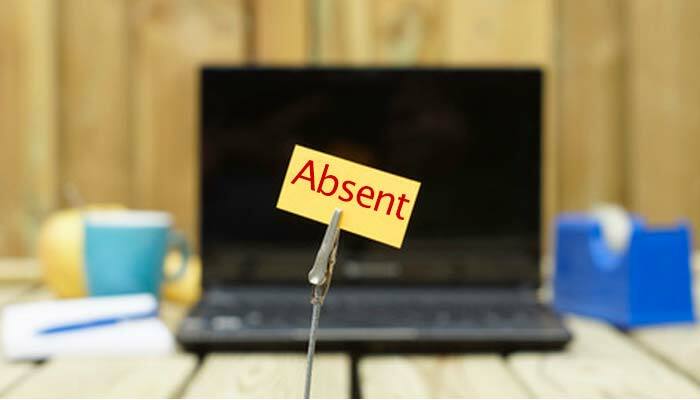 You might be thinking how an attendance management software would help you in curing absenteeism? Though an automated system can’t help you treat the irregular employee attendance, it can give you control over numerous processes that will help you cure the problem of absenteeism from the roots. It’s the best feature you can bestow your workforce with, especially when you have flexible shifts. It makes your workforce capable of managing their working hours without bothering HR people on daily basis. Even if your employees are working in different time-zones in multiple shifts, HR managers can easily sync the attendance records without manual interventions. Sounds quite relieving for HRs, right? The leave management feature enhances transparency in the system wherein an employee can manage his/her leaves. A comprehensive detail of total leaves allowed will get automatically updated as per the specified leave policy. Moreover, the employee can raise a leave request or can kick-start the encashment process for the leaves accumulated. With technologically advanced attendance software, HR managers can easily assign shifts to the different employee working in different departments without any hassles. Shift management wouldn’t be confusing anymore! In addition to management, configuration of attendance is a functionality that can make HR more efficient. An HR manager can specify the details they want employee to input and can also restrict them to modify certain fields. This functionality helps HR to make attendance management more precise and effective. Some attendance management systems now come with an additional functionality to integrate the external applications. The most common integrations that companies look for is payroll and biometric attendance. They want their payroll calculating system or biometric attendance to be integrated with the automated attendance management system to avoid manual interruptions in salary processing. And the additional benefit of customization serves like icing on the cake, allowing HR department to work more efficiently on business development strategies and identifying the new practices that can enhance the overall organizational effectiveness. Following such précised activities will help HR to take strict actions towards regular absentees, reducing the absenteeism rate drastically. This will further result in efficient management processes and improvement in employee engagement. The more efficiently you deal with employees’ concerns, happier will be your workforce and lower will be employee absenteeism. However, take a tour through the best options of online attendance management system, match your preferences, talk to their representatives for thorough product information and then make a move to purchase. Gunjan Bhatia is a Director at Saigun Technologies. She believes that people are the most important asset and by engaging and empowering the people, an organization can see a better tomorrow. Her blogs deal with HR and talent management.